Lions are commonly seen in most parts of Botswana. Best lion sightings in Botswana are in the Savute -Chobe National Park. Even though lions don't like water sightings of lions in the northern Okavango Delta are also spectacular. The lions have learnt to thrive there - mainly due to the large buffalo population. The Lions of Botswana have torn up the rule book as we know it. Lions don't like water, lions seldom, if ever, hunt elephants, hippos and lions need water to survive - these are some of the ideas that we have learnt over the years. In Botswana lions take to the water regularly, lions do hunt elephant and hippo and in some areas of the country lions can go for moths without drinking water. Due to the range of eco-systems in Botswana the size of lion prides shows a great variation from area to area. Prides in the Central Kalahari will generally be smaller than the prides in the Okavango and other northern wilderness areas. This is because of the availability of food is less in the drier areas. The larger prides in these arid areas will often split into smaller sub-prides during the dry season. Home ranges of the lions vary in size for the same reasons - availability of food. In the arid areas the home ranges will be much larger and a great deal of overlapping with neighbouring prides occurs. Lions in the Okavango Delta are adept at negotiating the channels and floodplains in order to hunt. Prey moves between the islands and lions have to cross the water to follow. Because of this water activity the front quarters of the Okavango Delta lions are more developed than those of other lions. 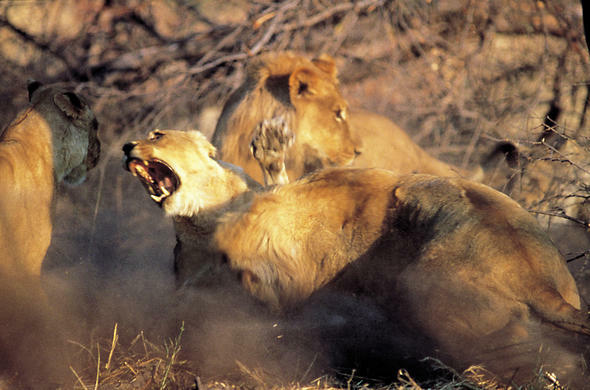 The lions of Botswana have the widest range of large prey species than anywhere else on the continent. From buffalo to hippo and even adult elephant the there are prides that have adapted to preying on all.